Usually when I am considering whether or not to buy a new cookbook, I have a rule. I have to at least intend to make at least half the recipes in the cookbook to actually buy it, otherwise it’s good to check out from the library to read through the couple recipes I’m interested in. Often, if the cookbook has them, the breakfast and the dessert sections are a lock. (It’s hard not to like those…) Its the main dish sections, usually the reason I’m interested in the cookbook in the first place, that tends to disqualify them. As a rule, we eat beef, chicken, and vegetarian recipes most often. If a cookbook is heavy on pork/ham recipes, or seafood, I usually pass it by. 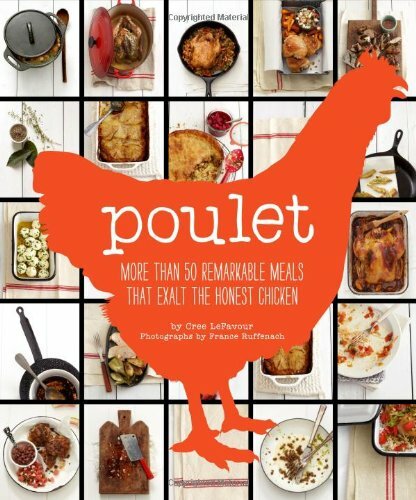 This is why, when I came across Poulet, a cookbook entirely comprised of chicken and side dish recipes, I was so excited. Most of the recipes call for either a whole chicken, something I’ve finally gotten used to working with, or chicken thighs, which are, admittedly, easier, but don’t make as frequent of an appearance. I still hesitated, as Poulet doesn’t just explore American-style preparations, but also Bistro (french-influenced), Latin, East Asian, South Asian, and Middle Eastern and African preparations. Some (Roadside Chicken Tacos!!) immediately sounded good. Others, (such as the Chicken-Vegetable Kadhi) I simply have no point of reference for, and so I didn’t know if we’d like them or not. Still, I ended up buying Poulet, and have never regretted it. I’ve pushed myself, (and my family) to try new things, all while still having the familiar comfort of a food we’re all used to, and genuinely like. I would definitely recommend this cookbook if you are trying to branch out in your cooking, if you want some easy recipes that will quickly become family favorites, or if you want to save money by buying bone-in chicken and whole birds. Poulet is great for all of that. I hope you’ll enjoy it as much as I do.